Toto lived on a South Sea island. All around him grew the tall coconut palms; wonder trees they called them, for they were the very life of the island itself. They provided Toto's family with food, drink, shelter; the empty shells made household utensils; the roots were brewed for medicine. Woven leaves were made into mattresses, and the trunks, hollowed to fit the shape of the head, became pillows. When they went fishing at night, the finely twisted fibre was used for lines, and coconut oil lit the torches. 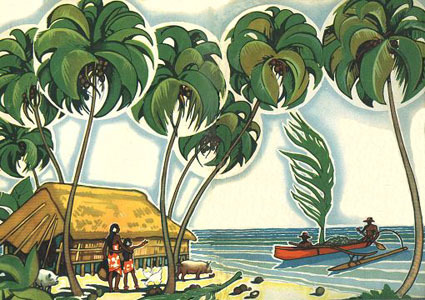 Yes, Toto was proud of the coconut tree, and grateful for all that it gave him. Here is the story of everyday life of a small boy in a strange land, far away. We share his excitement when the traders come for the year's pick of copra, and he gets a new guitar. Toto does not know about the many things we make of this copra. The candles and the coconut on your birthday cake come from Toto's wonder tree!